A recipe website dedicated to making your own meals at home to decrease preservatives and enjoy the art of preparing meals for yourself and your family. 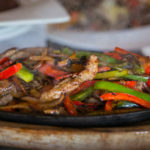 Every time I go to a Mexican restaurant I love watching the steam roll across the room as the server delivers a plate of steak fajitas to a lucky customer. Not to mention the mouth-watering smell that it provides as it drifts by the table. I love Mexican food and I always promise myself that I am going to branch out and try something new and different from the expansive menu at my favorite local establishment. So I sit down to look at the menu and within minutes I get a whiff of an order of steak fajitas and I lose all control. I slowly close the menu and when they take my order, steak fajitas it is! I am never disappointed with the flavor or texture of this classic meal. The meat is super tender and the vegetables are cooked to perfection. 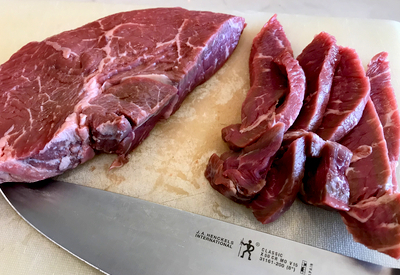 Cut the steak across the grain in thin strips for best results. Not too soft, and not too crunchy. Most of the time I don’t even bother putting them on a tortilla. I just place the steak, peppers, and onions on the bed of lettuce, add a little pico de gallo and guacamole and I am in heaven! Because of my love for them, I knew that I had to recreate the steak fajita recipe at home. I tried a few times, and although the meat was flavorful and tender, the veggies just weren’t perfect. The texture was good, but they had no flavor. Of course, they had a pepper and onion taste, but they didn’t have that traditional fajita seasoning flavor. The next time that I decided to try to make them at home, I decided to pour some of the steak marinade in the bag with the pre-cut veggies as well. It is important to marinate both the pepper and onion mixture and the steak. Both the steak and the peppers and onion combination was filled with that traditional steak fajita flavor. Everyone raved about them and now they ask me to make them at least once a week! So now I need to go back to my favorite Mexican restaurant and finally order something new! 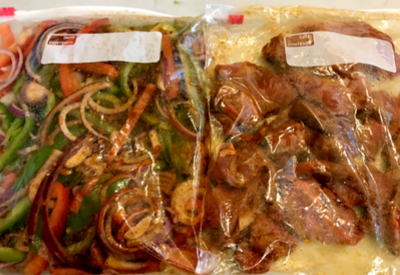 If you prefer chicken fajitas check out our easy to make Instant Pot Chicken Fajita recipe. Check out the printable recipe below and all of our recipes and let me know what you think! To receive our 3 Recipe Articles in your inbox each week, sign up for our free email list. You can also follow us on Facebook, Twitter, Pinterest, and Instagram. This article may contain affiliate links. 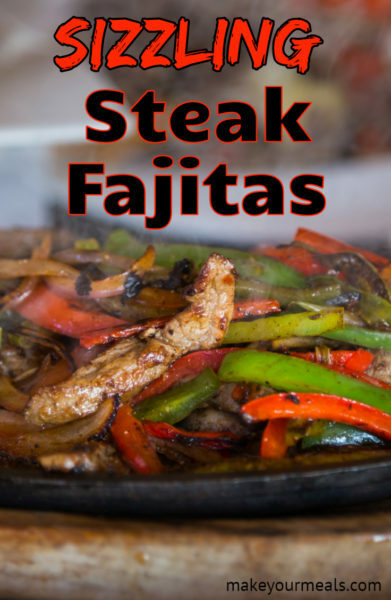 A homemade fajita marinade makes these steak fajitas extra tender and delicious. In a medium bowl, add olive oil, garlic, lime juice, chili powder, ground cumin, salt, black and cayenne pepper and whisk together until well incorporated. Place the steak into a sealable bag and pour 1/3 of the marinade in with the steak. In another sealable bag, add the peppers and onions and pour 1/3 of the marinade into the vegetable bag. Place both bags in the refrigerator for at least one hour. Heat a large skillet over medium-high heat. Pour the vegetables into the skillet and cook until slightly tender, approximately 5 minutes. Transfer vegetables to a plate and add steak strips to the same skillet. Cook the steak until almost done and then add vegetables back to the skillet. Pour the remaining marinade in the skillet and heat through. Serve with warm tortillas and garnishes of your choice. Looking forward to try this! Are the vegetables and meat cooked with the sauce they are marinaded in or are they drained first? Also what is done with the last 1/3 third sauce that is heated? Thank you. The sauce is cooked with the meat and vegetables. Just throw the entire bag of contents in the skillet. Then in step 7 you will add in the remaining sauce with the steak and veggies right before serving. Hope that helps!